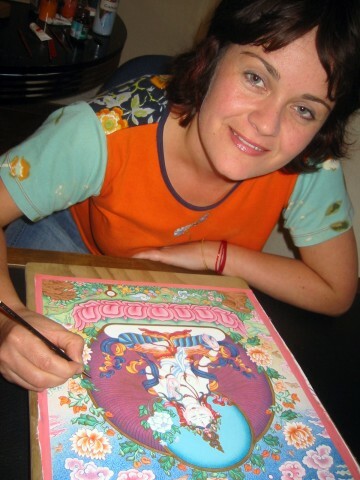 Ella is a New Zealander who completed a six-year apprenticeship to Andy Weber internationally renowned published artist and expert in the field of Tibetan art. Ella has a fine arts degree in painting from Auckland University in 1994. She then qualified as a teacher and taught secondary school for ten years in New Zealand and Britain. Following investigation of various spiritual paths, Ella discovered Tibetan Buddhism and was immediately attracted by the authenticity and warmth of teachers such as His Holiness the Dalai Lama. Wishing to merge her creative and spiritual life she went on pilgrimage to Nepal and India and eventually found her art teacher Andy Weber in London. Ella moved to live near Andy in Cumbria, England. Ella's artwork features in several FPMT Buddhist centers and homes of Buddhist practitioners. The FPMT (Foundation for the preservation of the Mahayana Tradition) was started in the early seventies by Lama Yeshe and Lama Zopa. Tibetan Buddhism emphasizes the use of art to inspire and lift the mind and heart. It is Ella's heart wish to be of service to the Buddhist and wider community by making and teaching others to make holy objects in this tradition. Ella is currently working on commissions for individuals and Buddhist centers and teaches painting full time at Epsom Girls Grammar. Ella has begun a series of paintings of the Mahamudra Lineage masters for the Mahamudra center in Colville, Coromandel. Six paintings (out of thirty six!) have been completed due to the kindness of sponsors, including the late Terry Leach who initially asked Ella to paint the masters to fulfil the wishes of Lama Zopa Rinpoche.